I go to my post office box once a week. I insert my key and kaplow out comes a pile of junk mail. Sometimes I think I am just paying for my post office box just so companies can send me junk, lol. 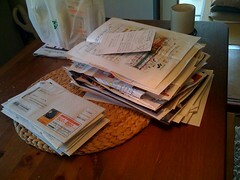 Just a few years ago I would’ve been ticked off to be getting so much junk mail but now I embrace junk mail. I love junk mail. I get junk mail from banks, auto dealers, insurance companies, fast food chains, super markets, travel, get rich quick schemes and the list goes on and on. Fortune 500 companies spend millions hiring the top advertising agencies of the world to create and come up with the best advertising. These advertising agencies take into account every little detail and every word that’s said. I know we don’t have millions of dollars to spend on the best advertising money can buy so why don’t we learn from these advertisers and put together the best of best for FREE. Let’s learn from our competition and such.